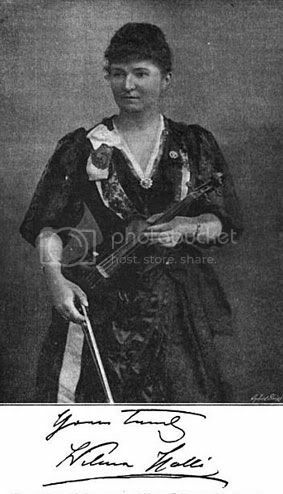 In my last blog entry, I transcribed an 1894 interview with Lady Wilhelmina Hallé, one of the greatest violinists, male or female, from the late nineteenth century. Here is the second half of the interview. After the Jansa concert Lady Hallé’s (then Wilhelmine Neruda) career formed itself, and the little artist threw her heart and soul into her studies. We hear that in 1849 the gifted child made her first appearance in London on the 11th of June at the Philharmonic Concert, where she made her debut before our warm-hearted English public, which has never forgotten her effective rendering of one of De Beriot’s concertos, and ever since has recognized in her one of the most accomplished musicians of the century. For anyone that wants to see how this article was originally laid out, here is the link to the scan. Hi, thanks! Your findings are always very interesting!